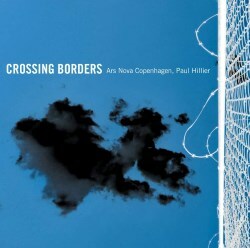 The impetus behind this disc seems to have been two fold, firstly, after Sweden set up a border post on the famous Øresund bridge, the Swedish members of the choir had to cross over the physical border to rehearse and perform, and secondly, it grew out of the group’s first performance of Line Tjørnhøj’s Vox Reportage, a work which pushes the bounds, and thus borders, of vocal music. The disc opens with hardly familiar music and this despite it being by probably the best known composer on the disc, Carl Nielsen. Anyone who has heard Ars Nova Copenhagen’s wonderful disc of the composer’s choral songs (6.220569) will know what an accomplished composer for choir Nielsen was, however this aspect has, until recently, been neglected outside Denmark. They are finely brought pieces that build well upon the Danish choral tradition, here however, Nielsen takes a step away from the traditional and produces music based in the ‘Palestrina style’ whilst also including aspects of his own orchestral writing in the vocal line, this was due to his composing the tune first, only after this did he look for words to fit, despite this the resulting Motets are wonderful. The following short piece, Som markens blomst henvisner fage by Niels W. Gade, a composer of the ‘Golden Age’ of Danish choral music. It is a deeply romantic work, Gade knew the likes of Schumann and had for a short time replaced Mendelssohn after his untimely death in 1847 as conductor of the Leipzig Gewandhaus Orchestra, and his own music was deeply influenced by the romanticism that flourished in central Europe of the time. Although Swedish, Wilhelm Stenhammar’s Tre Körvisor set Danish texts by the poet Jens Peter Jacobsen. Again, this is a neglected area of the composer’s music outside his native land, and while he is primarily known for his symphonies and piano concertos, these three tiny pieces, the longest is only two minutes long, show a composer more than at home with composing for the voice. Paul Hillier, in his excellent notes that accompany this disc, talk of the music of Vagn Holmboe as being largely ignored outside his native Denmark, I must be an exception to the rule as I have a lot of discs devoted to his music, as well as a book dealing with the composer. That being said, the Two Border Ballads are new to me, and despite the texts being two British songs, they are still imbibed with the composers own nationalistic style. Anyone who knows Benjamin Britten’s Serenade will recognise the second piece, The Lyke-Wake Dirge, but here it is treated in a totally different way, one that removes it from its original folk inspired tune and made to sound anew. Whilst the first four composers address national, language and physical borders, Line Tjørnhøj, in her work, Vox Reportage, which was composed especially for the choir, addresses more the borders of the vocal soundworld. This is a compelling work, one that takes a few listening, but the rewards, it builds partly on the concept of the vocalise, but here the choir produce sounds more akin to synthesised music, whilst also singing and speaking the text, some of it almost in the form of news bulletins. So a challenging work at first, but as you listen again the fruits of the composers work with individuals and small groups of the choir during the compositional process starts to pay off. This is a wonderful disc, one in which the Ars Nova Copenhagen are, as ever in peerless form, they meet whatever is thrown at them head-on and produce a wonderful sound. I have a number of their discs, but this one is one of the most compelling, with its breadth of styles and music it would challenge any choir, but I am glad to say that the Ars Nova Copenhagen are equal to all of them. As mentioned above, Paul Hillier’s booklet notes are excellent, he discusses the performing difficulties of the Nielsen and the choices made of the performing edition well, and Line Tjørnhøj introduces her piece in a manner that only enhances the performance. Excellent recorded sound helps the choir, especially in the Line Tjørnhøj, making this a very desirable release.